Char Kway Teow also known affectionately as CKT in some circles is a stir fried rice noodle dish with countless variations. My version normally has prawns in it but had leftover chicken and BBQ pork in the fridge so used that instead. 2. Heat 1 tablespoon of oil in a seasoned wok over high heat. When oil starts to shimmer add chilli and garlic paste and cook 10 seconds until fragrant. 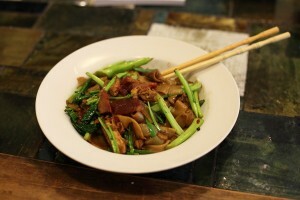 Add gai lan and stir fry for 1 minute until leaves have softened. Remove contents of the wok to a bowl. 3. Add another tablespoon of oil and fry lap cheong, chicken and pork for 1 minute or until heated through. Remove contents of the wok to a bowl. 4. Add 1 tablespoon oil to the wok and heat until smoking. Add noodles and spread out up the sides of the wok to get nice and charred. Toss a few times to make sure noodles don’t stick. Add soy sauce and kecap manis and cook 20 seconds. Add garlic chives and stir through. 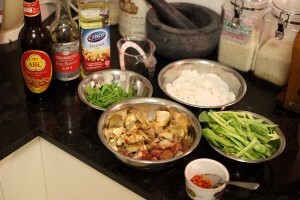 Add cooked ingredients to the wok and stir well. Serve immediately. You are currently browsing the Tina’s Foodie Blog weblog archives for April, 2010. Entries (RSS) and Comments (RSS). 27 queries. 0.234 seconds.